For the past 15 years or so, Rabindranath Das has been watching the ground slip away from beneath his feet. 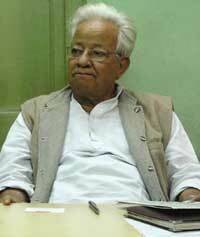 Back in the 1990s, his family had about 3.5 hectares (ha) of paddy fields along Ghoramara island's northwestern shores. But every year, especially during the monsoons, the Hooghly's strong undercurrents would erode a bit more of the riverbank's slopes, triggering sudden collapses of large sections of the bank. Every year, either the river or advancing embankments would swallow a fresh swathe of his family's land. 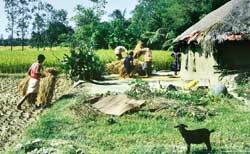 Now, less than a quarter of a hectare and the thatched mud house they live in, remain. The paddy harvested from this field feeds Das's 12-member family--wife, young children and parents--for less than three months. So, every year he leaves his tiny island for the mainland for months at a stretch to work as a daily labourer harvesting paddy in other people's fields or excavating mud from riverbanks. The money he brings back helps make ends meet. But just about.There are days, he admits, when the kitchen fires can't be lit. "Next monsoon, when they build the boundary wall around the island afresh, we will probably lose the last bit of our land. It will fall outside the embanked area. 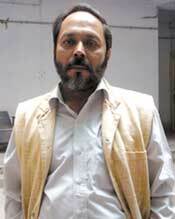 Like most of the people here, we too will become bhumiheen (landless)," Das says. But even then, he won't leave the island. So what if there'll be nothing left to live on, he intends to cling on to the only home he's known till the briny waters of the Hooghly and Bartala drag away the last bit of solid ground. "Till the day Ghoramara is here I will be here," he says. Unfortunately for Das, from the looks of it that day isn't too far away. Settled some 200 years ago, Ghoramara, apparently so called because a raja of the area, Pyarimohon Mukherjee, lost his horse (ghora) to a tiger while on a hunt in the island, was among the first of the islands in the Sunderbans region to be turned into a British outpost. It once boasted of the Sunderbans's first post and telegraph office and police station. Now both have moved to the larger Sagar island. According to the local panchayat office, the island then had an area of 3,912 ha. It's less than a third that size today. What's left is going. Fast. Researchers at Jadavpur University's School of Oceanographic Studies (jusos) in Kolkata say Ghoramara has been reduced in size by 41 per cent since 1969, displacing 7,000 islanders over the past 30 years. They predict the 3 km by 3 km piece of land that still offers shelter and sustenance to some 5,400 largely marginal farmers, fishermen and daily labourers, might not last beyond 2020. In fact, they say in another 15 years the sea will lay claim to a dozen islands in the Sunderbans, six of which are populated, rendering about 70,000 people homeless. These predictions are part of a study researchers at the university have conducted over several years to assess the vulnerability of the ecologically sensitive Sunderbans island system vis--vis climate change. jusos has now compiled a report for the Union ministry of environment and forests. The vanishing lands will mean displacement, and loss of livelihood for many villagers. But the state government, which is only too well aware of the Sunderbans's rapidly diminishing landmass, is yet to come up with a coherent resettlement plan. The last frontier of the Bengal floodplains, the Sunderbans is a sprawling archipelago of several hundred islands, some large, some minuscule, stretching nearly 300 km between West Bengal and Bangladesh. It is part of the world's largest delta (80,000 sq km) formed from sediments deposited by three great rivers--the Ganges, Brahmaputra and Meghna--as they empty into the Bay of Bengal, and is also among the world's largest mangrove forests. 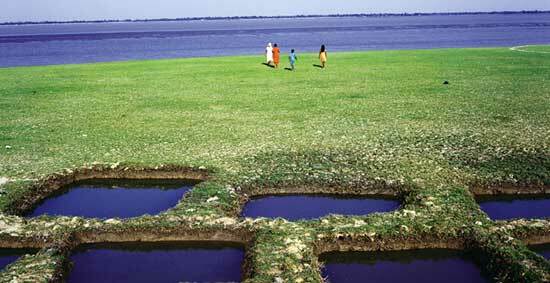 The region is crisscrossed by a maze of tidal rivers, estuaries and creeks that carry saline water nearly 300 km inland from the Bay of Bengal. The islands are low, marshy alluvial plains that are still in the process of being formed and reformed by continuous siltation and powerful tidal currents. What land the waters swallow from one end, they spit out as sandbanks and new islands at another. The West Bengal part of the Sunderbans makes up 60 per cent of India's mangroves and comprises 102 islands, of which 54 are inhabited.Most of them were reclaimed and inhabited under the British, who, in the late 1700s, undertook a massive drive to clear the forests and make the land cultivable, so that people could be settled there and the government's revenues augmented. Over two centuries of converting mangrove forests into paddy land, the exploitation of the area's natural resources, and hunting and poaching have all contributed to the degradation of this region, making it increasingly prone to erosion and vulnerable to storms and cyclones. The 54 inhabited islands have no forest cover left. However, about 10,000 sq km of the Sunderbans are still covered by swampy mangrove forests (40 per cent of these lie in India and the rest in Bangladesh), much of which vanish under water for several hours a day during high tide. These dense, almost impenetrable estuarine forests have an amazing biodiversity. They are home to over 100 plant species and a variety of animals including Royal Bengal tigers, estuarine crocodiles, sharks, spotted deer, wild boar, Gangetic dolphins, otters, Olive Ridley turtles and numerous species of birds and snakes. These mangroves also act as a natural shield for the Bengal coastline, protecting it from storms, cyclones and tsunamis by absorbing much of their destructive force. The Sunderbans, however, is best known for being the largest remaining natural habitat of the Royal Bengal tiger. It was the realisation that the big cat's numbers were fast dwindling that triggered India's wildlife conservation movement in the 1960s. By then, the changing landscape had already resulted in the disappearance of the leopard, wild water buffalo, Javan rhinoceros, one-horned rhinoceros, swamp deer, hog deer and several plant species. In 1973, the Indian government declared 2,585 sq km of the Sunderbans a tiger reserve under Project Tiger. In 1985, the area was included in unesco's list of world heritage sites and in 1989, India designated 9,360 sq km of Sunderbans a biosphere reserve. While these measures helped safeguard what remained of the Sunderbans, they also helped promote its image as a mysterious and exotic forest. An image that relegated the region's human inhabitants to the background and obscured the fact that the Sunderbans supports a population of 3.9 million people, most of whom eke out a precarious living on these fragile, flood- and cyclone-prone lands by farming, collecting forest produce and fishing. This pit the protection and preservation of the mangroves against the needs of the local inhabitants. The population density here is high. Government figures peg it at 1,200 people per square kilometre. Yet human settlements are hard to access, subject largely to the ebb and flow of tides and the availability of ferry rides. The 45,000 sq km of inhabited area has only 280 km of paved roads and a mere 42 sq km is accessible by rail. Sagar Refugee Colony, Ganga Sagar gram panchayat: Ever since her older son went off to work as a daily labourer in Kashmir two years ago, Sahajadi Bibi has to worry a little less about how to feed her family of eight. The money he sends now and then through unofficial channels and the Rs 10,000 to Rs 12,000 a year she, her younger children and daughter-in-law make from fishing for tiger prawn spawns (locally called meen) in the river and the grain from her quarter-hectare paddy field keeps the widow's family fed most months of the year. That doesn't mean things are easy. It's just that the provisions can be stretched a little bit more and she doesn't have to go knocking on neighbours' doors for rice quite as often as she used to. The time when she owned 3 ha of farmland on Lohachara island is slowly receding from her memory. Much the same way as that land slowly slipped into the waters. It has, after all, been two decades since she and her late husband moved to Sagar, when the government offered them a plot at the refugee colony. "Ours is a life of much pain," she says, as she watches her young daughter-in-law dandle her five-month-old son on her knees. "Everyday is a struggle, what more can I say." Refugees from Lohachara and the lost bits of Ghoramara currently add up to over 6,000. The local government, namely the Sagar block administration, has, since the 1980s, been resettling them on vested state land in Sagar, the largest island in the Sunderbans. In the remaining 18 blocks of the Sunderbans, refugees haven't yet become a pressing problem. Families have been given two acre to one-sixth-acre plots in four refugee colonies that have come up on previously uninhabited land. The paddy grown on these tiny plots don't feed families for more than a few months. 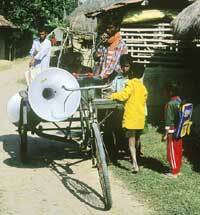 Since there are no industries in Sagar other than fishing, employment options are few. Most families, even regular settlers, have to rely on daily wage labour to make ends meet. The men go out and get jobs harvesting paddy in other farms, excavating mud from riverbanks or take up menial jobs in Kolkata. During the fishing season, whole families move to temporary camps by the sea for a few months to help with the catching, drying and transporting of fish. Sometimes, as in Sahajadi Bibi's case, the men move to far off places like Allahabad and Kashmir. Of the approximately 37,000 families in Sagar block, around 9,000 have at least one male member working outside. The women usually stay behind, waiting for their men to send money that often never turns up. What Ismael fails to note is that Sagar itself is among the region's more vulnerable islands, constantly losing land to the sea. The island's famous Kapilmuni temple built about 200 years ago at the confluence of the Ganga and the Bay of Bengal where the Gangasagar mela draws lakhs of pilgrims every year, was moved at least three times in the past century as the waters ate away more and more land. The new sandbanks that have come up on the island's southern end are minuscule, compared to what's being washed out to sea. Researchers say the island is likely to lose another 15 per cent of its landmass by 2020. The pressure of increasing population on the island is evident in the way successively smaller parcels of land have been allotted to the refugees over the years. When reminded of all this, the elderly Ismael smiles benignly. "As long as we are here we will help our neighbours," he says. Not all old Sagar settlers share his views. Residents at the refugee colonies say that though there haven't been any serious confrontations, rumblings of discontent from old settlers are common. They routinely have to hear complaints about how their arrival has reduced pasturelands, depleted tree cover and put pressure on the island's resources. Besides, state officials say, the government has no excess land worthy of habitation in the Sunderbans other than at Sagar. If the 70,000 projected refugees land on Ismael's doorstep 15-20 years later, his magnanimity will be severely tested. That islands are losing landmass and creating thousands of environmental refugees is not really breaking news. It's been happening for years now. 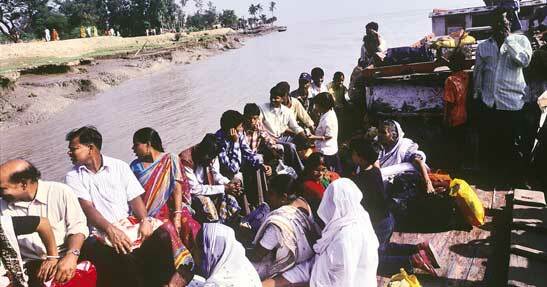 Yet, the state has no such thing as a disaster management plan for the Sunderbans. All measures to rehabilitate environmental refugees so far have been ad hoc. This negligence stems from the perception among most state leaders and officials that the Sunderbans is a natural environment that people have infringed upon in the first place, says anthropologist Amites Mukhopadhyay. "Because this place has been assigned to tigers and crocodiles, people and their claims are somewhat secondary here," says Mukhopadhyay, who has spent five years researching the impact erosion of bunds and embankments is having on the people of the Sunderbans. "If you simply go through the budget speeches of the state assembly you find a lot of importance being given to land erosion by the Ganga in Malda and rehabilitation of people there, but little mention is made of the same problem in the Sunderbans." The government viewpoint, which is commonly shared, is that because people settled in the Sunderbans before the siltation process was completed they were probably working against nature and therefore it was ony to be expected that they will have to face the consequences of living on such shifting land. But from the perspective of the people, all they are trying to do is survive. The government's lack of concern to their plight only reinforces their perception of being neglected and marginalised, Mukhopadhyay says. The state has been making some noises recently about wanting to rectify the situation. In early 2006, it held a workshop on disaster planning at which there was some talk of drawing up a master plan to save the Sunderbans from erosion. An all-party team later met Union parliamentary affairs minister Priyaranjan Das Munshi who asked them to come up with a framework for the master plan. But not much has happened since then. The Sunderbans is sometimes referred to as Kolkatar jhi (Kolkata's maidservant) because a large number of people from this region work as household help in the homes of the city's affluent classes. Most of them are women. The term is a clear indication of how the inhabitants of this estuarine outpost are viewed by the rest of the state. The Sunderbans is populated largely by Scheduled Caste, tribal and Muslim communities, usually engaged in fishing, artisanal work and daily wage labour. Their ability to sustain themselves is as tenuous as the land is fragile. It is difficult to trace the historical pattern of how the Sunderbans came to be settled. The little information recorded is generally from British colonial records. According to one theory, the first to make a home in this inhospitable terrain were "boat dwellers"--peripatetic people who literally lived on the river and its resources--says Annu Jalais, an anthropologist at the London School of Economics. There is no evidence to support this theory. Archaeological evidence indicates that the Sunderbans were inhabited by some autochthonous tribes before the Indo-Turkish sultans began their reign in Bengal in the early 13th century. These tribes were later identified as communities of fishermen. The available evidence, contained in oral tradition and sometimes land revenue records, suggests that by the Mughal period the process of clearing forests and introducing settled agriculture was well under way. Sometimes this happened through the agency of the Mughal administration, but mostly through individual initiatives. Such initiatives were often authored by Muslim holy men who combined the task of introducing settled agriculture with the object of proselytisation. Often, however, these initiatives were ultimately subjected to the administration machinery of the Mughal establishment. In the process, many settled Hindu cultivating communities converted to Islam. When the British came to power in the late 1700s, they expanded and organised the process of clearing forests and introduced agriculture on a much larger scale. The existing people provided much of the labour, along with Muslim and Scheduled Caste Hindu labourers brought over from neighbouring districts. Official records show 48 of West Bengal's 59 Scheduled Castes are represented in the Sunderbans and 70 per cent of the state's Scheduled Tribes live there. More recent immigrants arrived from Bangladesh in the 1960s and and 1970s, especially after the Bangladesh war of independence in 1971 and Zia-ur-Rahman's coming to power in 1975 when communal agitations started to be directed against poor and low caste Hindus who had remained there after partition, says Jalais. Cross-border immigration continues till today. 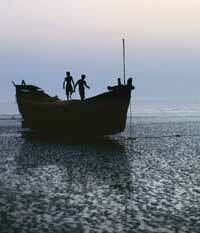 The Sunderbans is currently home to 3.9 million people. More than 90 per cent of the population here lives below the poverty line, according to state officials. "Before the introduction of shrimp seed collection in the 1980s the islanders had barely enough to eat. 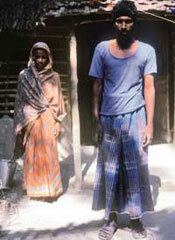 For many, especially those who owned no land, working in the forest was the only way of making a living," says Jalais. Lack of adequate means of communication with the mainland, overwhelming interest in the protection of the Royal Bengal tiger and their lower caste status has relegated the inhabitants of this serenely beautiful, but harsh, land to the margins of India's social consciousness. But among themselves, they have over the years pieced together a now threatened sense of themselves as the people of the tidal land. So, is there any way the islands can be saved while maintaining the ecological balance of this unique mangrove system? The problems of human habitation in this region are so complex that it seems there is no definitive answer. When these lands were initially cleared of forests and settled, no one took into account the fact that the islands were prone to inundation twice a day during high tides. To combat this flooding and to prevent saline water from entering their fields, the early settlers built 35,000 km of crude mud embankments along the islands' perimeters. But these bunds, no matter how high you build them, are neither ecologically sound (they block siltation and hamper the normal land formation process) nor foolproof. During cyclonic storms, crashing waves easily breach the loosely packed walls, and on any given day, strong underwater currents quietly and steadily erode the slopes and foundations of the embankments causing large sections of it to suddenly crumble into the sea.In fact, most breaches are caused by these underwater currents, which can't be controlled. Which is why Tushar Kanjilal advocates the 'open system' option. Though not a permanent solution either, this more organic system involves regular monitoring of physical developments in and around the islands and initiating natural defence mechanisms. Kanjilal, a Padma Shree recipient who's spent over three decades working on rural development in the Sunderbans, says the key to combating this natural phenomenon is not by creating artificial barriers, but rather understanding the system and working in harmony with it. "The efficacy of the 'Open System' is dependent on an improved data base relating to tidal regimes, impact of water flows in the Sunderbans waterways and the accumulation and erosion of silt deposits," Kanjilal writes in his book Who Killed the Sunderbans? "It's useless to spend money repairing the embankments while ignoring the root cause of their weaknesses," he says. The only viable solution, he says, is to push the existing embankments further inland and build ring embankments around the islands with mud still the primary raw material and supplement this with mangrove plantations along the riverbanks to arrest and hold silt down. Hazra suggests enforcing the coastal regulatory zone stipulation of barring habitation within a distance of 500 metres from the coast and instituting "informed retreat" of inhabitants from vulnerable zones. "Of course, for this the administration will have to first admit that this is happening, but to date there has been no official recognition of the state of the crisis the Sunderbans's inhabitants face," he says. Sunderbans affairs minister Kanti Ganguly, however, seems ready to take Hazra for his word, even though he hasn't seen the jusos report. "It is definitely not possible to relocate so many people. We will consult the oceanography department about what to do and whatever environment protection is possible will be tried," he told Down To Earth. Ganguly also said he would ask Union minister in charge of ocean development Kapil Sibal to provide expertise to tackle the situation. For all these measures to be effective, participation of the local people is crucial. Which again brings in the role of education and the need to provide the basic needs of people, such as energy supply, healthcare and livelihood options. As long as these needs are not met people will continue to cut trees and mangroves for firewood and to make money. "We have found education plays a great role in disaster management, but though the official literacy rate in this region is high, so is the drop-out ratio after Class V," says Rajashree Dasgupta, a research fellow at jusos who is part of the climate change research team. "There's virtually no enrolment of children between six to 14 years. So people here may be technically literate, but they are not educated." Though every block has a government hospital, most of them lack adequate equipment, staff and medicines. The health system is so poor on most of these islands that the state has had to hook up with local ngos to provide mobile health services. While the state is yet to formulate an action plan on island erosion and refugee rehabilitation, the Sunderban Development Board, on the recommendation of international consultancy firm McKinsey, is investing Rs 650 crore on the overall development of the region. The entire sum is being provided by the National Bank for Agriculture and Rural Development and will be utilised to construct 23 bridges, 11 jetties and roads to connect far-flung islands to the mainland, develop market complexes, water supply systems, multipurpose cold storages, parks, community halls, bus terminuses and sports complexes. Work has already begun on 10 bridges. "Bridges are essential over some rivers like the Matla in Canning, which has no water during low tide," says Ganguly. Though the minister has given explicit assurances that all construction will be done "without disturbing the environment", many people are sceptical, especially when it comes to building bridges connecting shores that are constantly changing. Environmentalists also fear that sinking pillars in the riverbeds could change the direction of rivers. Kanjilal offers another argument. "Any development initiative in the Sunderbans is pointless unless the fundamental problems that threaten its existence are addressed," he says. "Let them build bridges," Hazra adds, shrugging. "After five years they'll be building them again." Hazra and Kanjilal are both pointing in the same direction. The problem is that for a couple of centuries no one has looked at the issue through the lens of the distinctive ecology of the Sunderbans. Few people have acknowledged that even in an 'unspoilt' state the region will be subject to the ineluctable pull of the tides. Thus the rivers will erode the land and the sea engulf it. The more the ecological balance is disturbed locally, through the destruction of the mangroves, and globally, through climate change, the more precarious the situation is bound to get. With a conservation perspective coming into the frame over the past few decades some of these issues have become more important. Unfortunately, this framework has blanked out the people who have lived here for many generations and whose fundamental quest is survival in what indisputably, though precariously, is home to them. 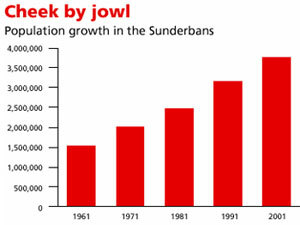 Which adds a further element of grim irony to the latest development plans for the Sunderbans.